Furniture Buffers is the maker of premium home protection products that “buffer” property such as floors, walls, countertops, electronics, and more to prevent grinding, scratching, and marketing. Furniture Buffers new non-slip furniture pads are making waves in the furniture and surface protection world. A little known fact is some people are fanatical about preventing damage to their flooring and other household valuables – so much so that they frequent home decor forums hunting for the best protectors for their surfaces and property. The problem for these damage prevention enthusiasts was there was no simple all-in-one solution to protecting not only floors but everything else. 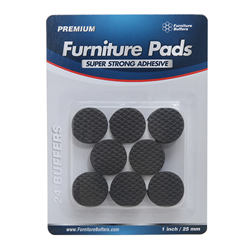 That’s when Furniture Buffers created it’s new non slip furniture pads with state-of-the-art rubber-foam cushioning that absorb shock and impact while protecting against grind and marks. Beyond the advancing technology, the progressive company also insisted on taking care of the basics that competitors had failed to fix for years. First, they made the self-adhesive on the pads super sticky to prevent them from falling off table and chair legs. Many consumers had complained even the best furniture pads were becoming unsticky and quickly falling off after a few weeks of use. Also, Furniture Buffers improved upon the non slip label with its outer shell waffle design. The waffle pattern helps grab surfaces so furniture and things stay in place and is just one more advantage Furniture Buffers non-slip pads give customers. Just in time for Christmas, the company has announced they will also offer a new line of felt furniture pads that offer medium-slide capability. What this means is now you can sit down at the dining room table and skooch out of your chair by pushing off the floor. Your hardwood or tile floor remains protected while you can handily exit from the table. Sometimes you might want furniture or other household things to stay in place – like frames on a wall – while other times you want them to be able to move around a little bit. Either way, FurnitureBuffers.com offers two sleek solutions that will keep your property safe and cushioned while going unnoticed in the shadows. Furniture Buffers is a Texas based company focused on protecting valuables in the home so furniture, surfaces, and electronics stay in mint condition and maintain their aesthetic beauty. Furniture Buffers is obsessed with product quality and customer service and has a standing lifetime guarantee on all of its products so all customers can be 100% confident in their purchases. To start protecting your floors and surfaces, visit http://www.Amazon.com/dp/B013MG9FJA. To learn more about the company, visit http://www.FurnitureBuffers.com.